Building a deck from wood requires special considerations due to the effect that moisture has on the material. One way that builders have designed to mitigate the spread of rot involves laying extra pieces of wood called sleepers. Sleepers help homeowners build decks with less effort and in tight spaces that don't allow for deep digging. The use of sleepers makes building a deck faster and easier. Sleepers come in a variety of materials, but only wood sleepers are regularly used in deck building. Concrete and metal sleepers work well for building retaining walls, but these materials are too hard to attach normal deck boards to for a basic deck. Treated and untreated wood sleepers come in a range of sizes because nearly any solid piece of lumber larger than 2-by-4 inches can be used in this way, depending on the size of the deck. Sleepers are placed between the deck surface and the ground or slab below it. A set of sleepers supports the decking and allows moisture and air to flow below it. Decking laid directly over packed soil will rot quickly, and wood laid over concrete rots, as well, when moisture is trapped between the two materials. Sleepers can also stabilize a deck when the frame has gaps that are too large to properly support the chosen decking boards. Sleepers keep your chosen hardwood materials off the ground. This allows builders and homeowners to quickly create a deck without building a full frame to support it. These pieces of lumber also work well to level an uneven area, so the deck lying over it doesn't tilt or slope. A sleeper deck doesn't require as much work as a fully framed and anchored deck, and it is much easier to remove when you don't want it anymore. 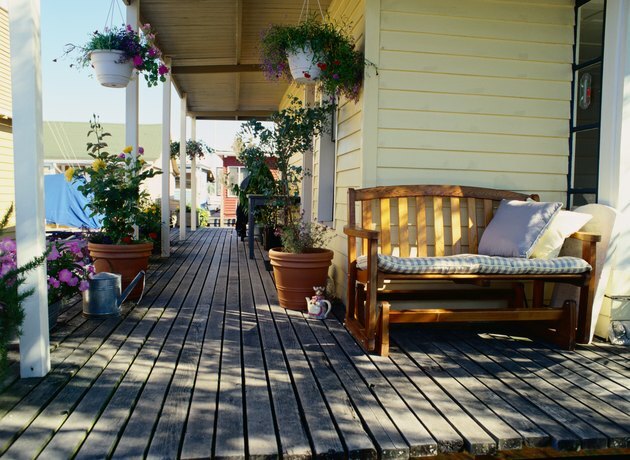 Most sleepers used for deck installation are pressure-treated with any number of toxic chemicals. Creosote-coated railroad ties are often chosen for their inexpensive price and for being a recycled product. However, the chemicals used to make this lumber rot- and insect-resistant pose health problems to anyone who spends a lot of time around it, according to the U.S. Environmental Protection Agency. Use treated wood for the sleepers only when they can be completely covered with decking to avoid unhealthy exposure to the chemicals.